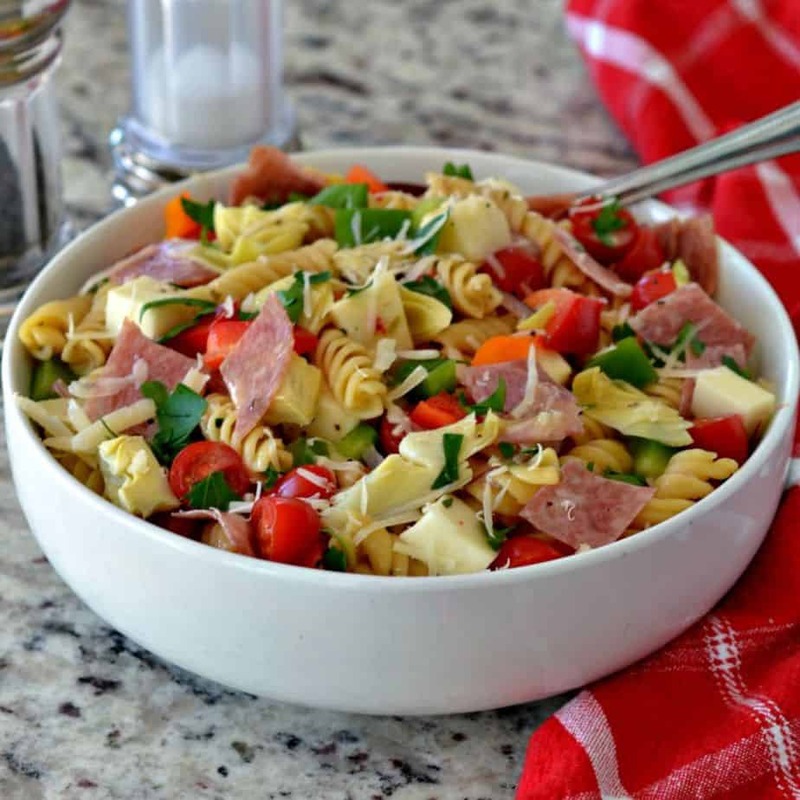 This Easy Italian Pasta Salad is so simple and so attractive that you can make it for a weeknight meal, lunch or even for a crowd. 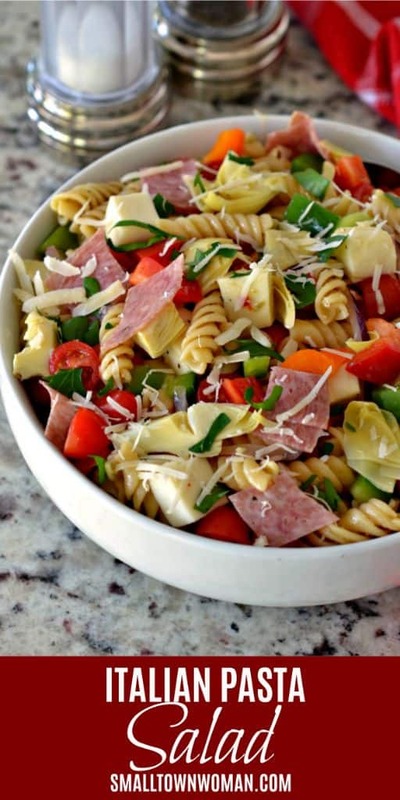 A great pasta salad can be enjoyed anytime of the year. 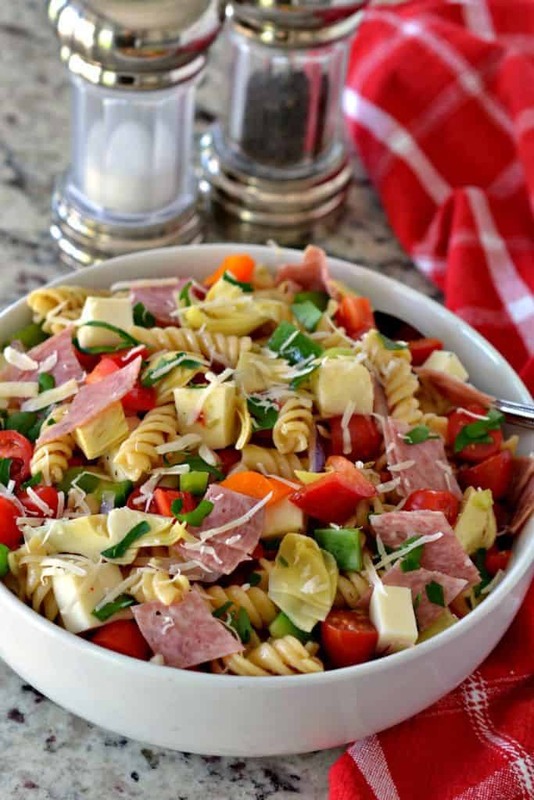 It combines rotini pasta, salami, fresh bell peppers, mozzarella cheese, artichoke hearts, grape tomatoes, sweet red onions and freshly grated Parmesan cheese tossed lightly with Italian dressing. You can use your favorite bottled Italian dressing or mix up your own. My favorite bottled Italian Dressing is Zias and it brings out all the delectable flavors in this pasta salad. However Zia’s is a local brand so I am not sure how far out of St. Louis you can get it. Maybe you have a local brand that you just love! This delicious Italian Pasta salad goes perfect with Chinese Five Spice Ribs and Grilled Marinated Chicken. How do you make Italian Pasta Salad? First boil your rotini noodles until they are cooked firm. Then drain them in a colander making sure to remove as much of the moisture as possible. Next combine the cooked rotini pasta, salami, bell peppers, mozzarella cheese, artichoke hearts, grape tomatoes, sweet red onions and freshly grated Parmesan cheese. Finally toss lightly with your favorite Italian dressing. Don’t overcook the pasta. It should be cooked fairly firm so it does not break apart when tossed or absorb too much of the Italian dressing. .
You can use any kind of small pasta such as bowtie, radiatore, small shells or mini penne. Use good quality Italian salami. Chop the vegetables small so they complement the pasta. If you don’t like something make a substitution. For instance if you don’t like artichoke hearts substitute black olives. As I always say don’t throw the baby out with the bath water. Use your favorite bottled or fresh Italian dressing. I have one right here. This pasta salad can be made up to a day in advance however you might want to add a couple tablespoons of Italian dressing to freshen it up. Wouldn’t this be so pretty for a party? I think it would look so pretty for a summer patio party or even a holiday Christmas party. It is an economically friendly recipe as well. What are you waiting for? 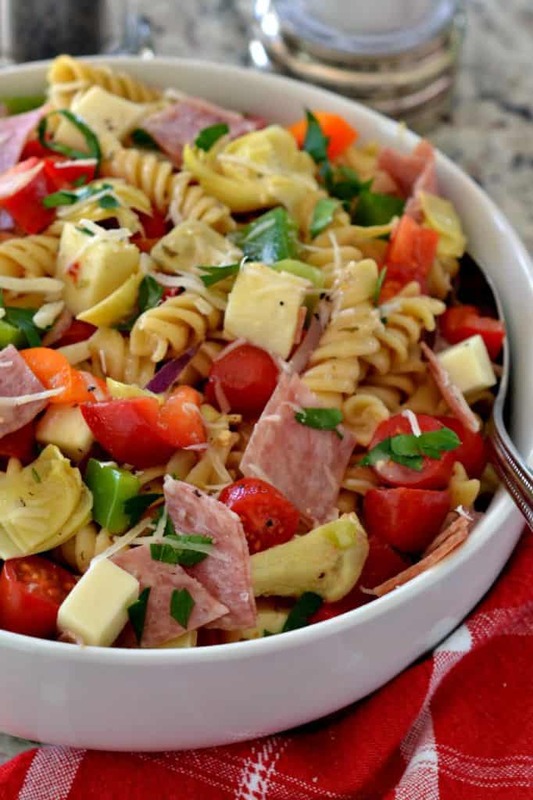 Put the ingredients on your shopping list today and make yourself an amazing Italian Pasta Salad. 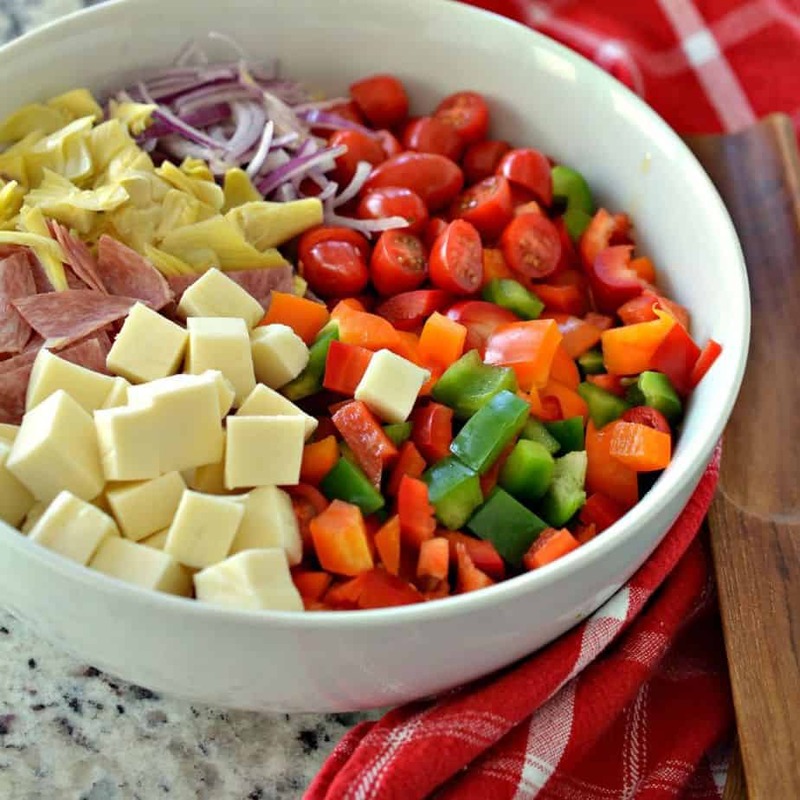 Other pasta salads you will love! This post was originally published November 1, 2016 and was republished April 22, 2019 with new content. Cook pasta according to package directions. Drain well and cool. 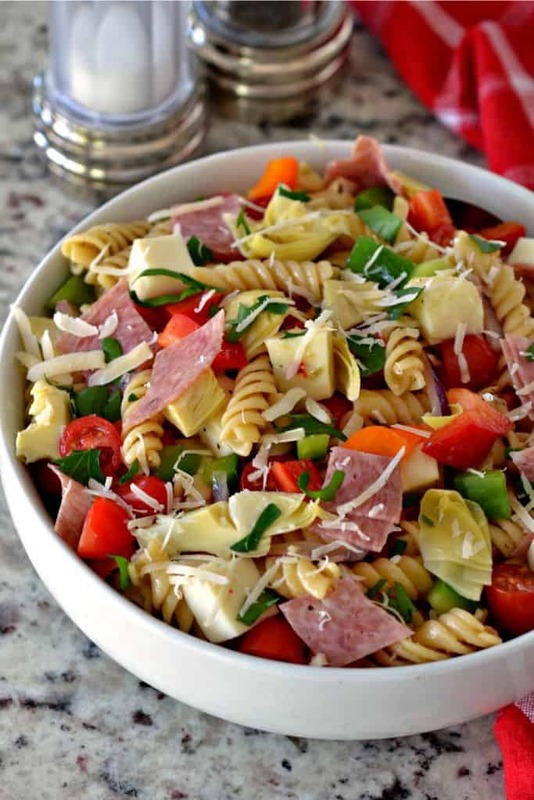 In large bowl combine cooked rotini pasta, salami, chopped bell peppers, mozzarella cheese, artichoke hearts, grape tomatoes, red onions and freshly grated Parmesan cheese. Toss with Italian dressing.